So why do we use Elekktric Trikkes? ﻿Ease of use = Less training﻿ - Since they have a stable three-wheel base of support, Trikke Electrics are simple to get started on and have a quick learning curve. Basic bicycle-riding knowledge transfers quickly to the new rider and it is very intuitive and easy to control. Ergonomically friendly - As long as you can stand up, you can ride a Trikke. You don’t have to worry about being hunched over handlebars, chafing your posterior on a seat or craning your neck to see in front of you. Uniqueness - Trikkes are unlike any other personal transportation vehicles (PTVs) out there. Portability - Because they can easily be folded up, Trikkes are easy to store and easy to transport. Exercise - Unlike most other PTVs, Trikkes (both electric and body-powered) provide a full-body workout.
. . . Drives like a sports car. Folds like an umbrella. SMART! Forget the Crowded sightseeing tours & Busses! 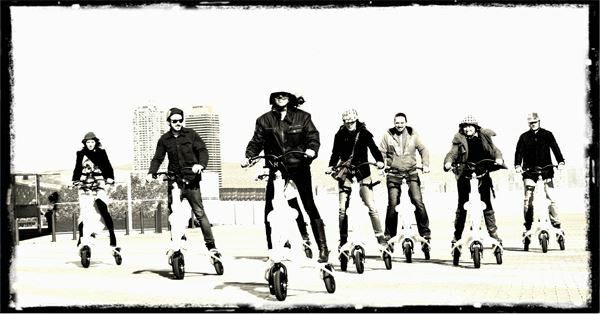 Come with us to discover the Gateway City or Just ride around and have the greatest fun ever!